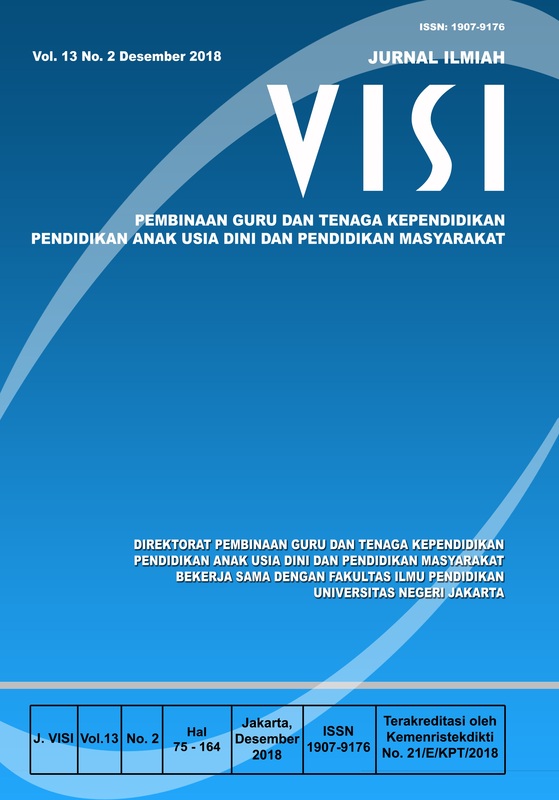 The purpose of this article is to provide an overview of the ability to read early for children with hearing impairment in Extraordinary Kindergarten in DKI Jakarta. This research is motivated by the limitations of the language possessed by children with hearing impairment due to hearing difficulties they experience. Due to hearing impairments, children with hearing impairment does not experience the acquisition of language, so they experience various problems, one of which is learning to read. Characteristically children with hearing impairment use the visual senses in learning to read the beginning. Reading the beginning for deaf children begins with the process of identifying words through images and writing in the form of visualization. The research method used is a case study. This research was conducted at Pangudi Luhur Special School in March-April 2017. Based on the results of the research, the reading ability of children with hearing impairment is still low and the ability of nouns dominates in reading the beginning, so it needs to be optimized using special media specifically designed to read the beginning. Allen, K. E., & Cowdery, G. E. (2009). The exceptional child: Inclusion in early childhood education. Clifton Park, NY: Thomson Delmar Learning. Bunawan, L., & Yuwati, C.S. (2007). Pemerolehan bahasa tunarungu. Jakarta: Yayasan Santirama. Choate, et all. (1992). Curriculum-bases assessment and programing. USA: Allyn and Bacon. Endaswara, S. (2012). Metodologi penelitian kebudayaan. Yogyakarta: Gadjahmada University Press. Santrock, J.W. (2008). Psikologi pendidikan. Jakarta: Kencana. Winarsih, M. (2007). Intervensi dini bagi anak tunarungu dalam pemerolehan bahasa. Jakarta: Depdiknas Dirjen Dikti.